HONG KONG, April 28 , 2016 - Delta Air Lines (NYSE: DAL) is the official airline sponsor for the upcoming Chinese movie "Book of Love," supporting the movie cast and crew's travel to the U.S. for the film's shooting, and facilitating various filming opportunities at airports and inside Delta cabins. The movie introduces attractive U.S. destinations such as Los Angeles and Las Vegas, to which Delta offers convenient non-stop or one-stop flights from Hong Kong and mainland China. The movie "Book of Love" will be released on May 5 in Hong Kong. This is the sequel to the No.1 box office movie "Finding Mr. Right," which was set in China, Seattle and New York in 2013. Seattle was the prominent destination featured in the first movie, with Los Angeles, Las Vegas, and other destinations to be introduced in the sequel. The movie's private viewing was held in Beijing on April 25. 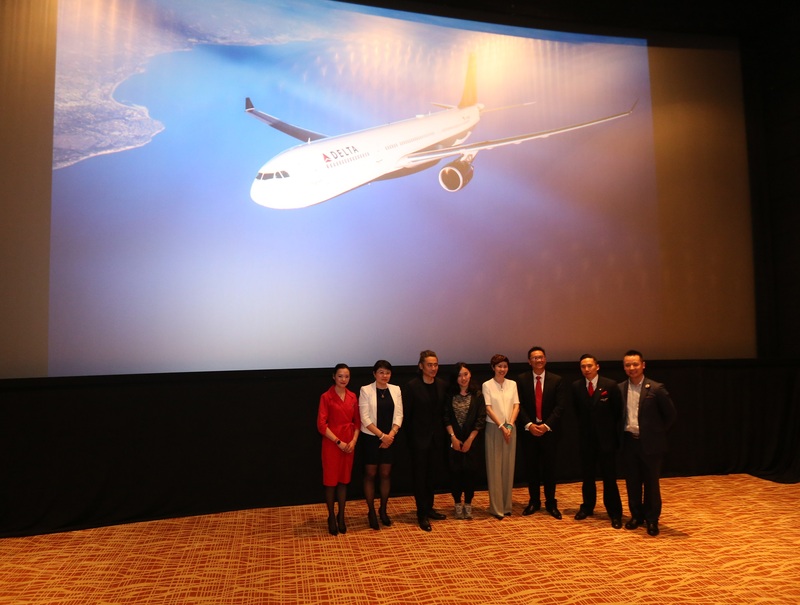 Director Xue Xiaolu was in the audience and thanked Delta for its support, "The movie was filmed in 8 countries and the support from Delta was crucial to the success of the shooting. I am truly grateful to Delta for their kind coordination and support. It is usually difficult for me to fall asleep during long haul flights, but when I fly Delta, I can sleep well." Lead actor Wu Xiubo also attended the premiere, "I am an aircraft lover. I was so excited when I stepped into the Delta One cabin in a wide-body (A330) in Hong Kong as it was my first time to do a shooting inside the aircraft. The scene at the Delta One cabin is tranquil and beautiful. Thank you Delta for your support!" To celebrate the movie opening in Hong Kong, Delta has launched an online campaign to give fans an opportunity to win free movie tickets. During the period from April 27 till May 3, each day every 10th eligible participant who submits the answer to a simple question and some personal details will receive two complimentary movie ticket redemption coupons. Campaign details can be found at http://delta-hkcampaign2016.com/landing.html (Campaign website available in Chinese only. Terms and conditions apply). "We are pleased to partner with ‘Book of Love’ to promote exciting U.S. destinations for the movie's audiences" said Wong Hong, Delta's President Greater China. "The movie scenes filmed on flights and in airports should bring to life the outstanding Delta flight experience our customers enjoy, along with highlighting some of our most popular Greater China to U.S. routes. It's truly a fantastic opportunity for Delta." Delta currently operates daily non-stop flights from Hong Kong to Seattle, Beijing to Seattle and Detroit, and from Shanghai to Seattle, Detroit, Los Angeles, and Tokyo-Narita. Delta has recently announced a new Beijing-Los Angeles service to the U.S. to be launched in Dec 2016 (subject to government approval). Together with partners China Eastern, Shanghai Airlines and China Southern, Delta offers extensive network connections to Greater China and the U.S. Directed by Xue Xiaolu and starring Tang Wei and Wu Xiubo, "Book of Love" is a movie about the turbulent romance between the charismatic Wu Xiubo and Tang Wei. As a sequel to the No.1 box office movie "Finding Mr. Right," the movie was filmed in China and the U.S. in 2013, then released in the U.S. and also in the U.K. Since the start of filming, the movie has been attracting the attention of movie lovers around the world. "Book of Love" will be released initially in China on April 29 and in Hong Kong on May 5. Delta Air Lines serves nearly 180 million customers each year. Delta was named to FORTUNE magazine’s top 50 World’s Most Admired Companies in addition to being named the most admired airline for the fifth time in six years. Additionally, Delta has ranked No.1 in the Business Travel News Annual Airline survey for an unprecedented five consecutive years. With an industry-leading global network, Delta and the Delta Connection carriers offer service to 324 destinations in 58 countries on six continents. Headquartered in Atlanta, Delta employs nearly 80,000 employees worldwide and operates a mainline fleet of more than 800 aircraft. The airline is a founding member of the SkyTeam global alliance and participates in the industry’s leading trans-Atlantic joint venture with Air France-KLM and Alitalia as well as a joint venture with Virgin Atlantic. Including its worldwide alliance partners, Delta offers customers more than 15,000 daily flights, with key hubs and markets including Amsterdam, Atlanta, Boston, Detroit, Los Angeles, Minneapolis/St. Paul, New York-JFK and LaGuardia, London-Heathrow, Paris-Charles de Gaulle, Salt Lake City, Seattle and Tokyo-Narita. Delta has invested billions of dollars in airport facilities, global products and services, and technology to enhance the customer experience in the air and on the ground. Additional information is available on the Delta News Hub, as well as delta.com, Twitter @DeltaNewsHub, Google.com/+Delta, Facebook.com/delta and Delta’s blog takingoff.delta.com.